The development of agriculture approximately 10,000 years ago gave rise to permanent settlements which grew into cities and civilizations. Emmer wheat (Triticum dicoccon), also known as farro, was one of the first crops domesticated in the Ancient Near East, which included the modern countries of Iraq, Syria, Iran, Turkey, Lebanon, Jordan, Israel, and Egypt. Emmer wheat is not cultivated today because it is a low yielding variety. Also, Emmer wheat is more difficult to mill into flour because the chaff does not come off through threshing. Much of our knowledge about ancient Egyptian bread comes from archeological excavations that have found dessicated bread in tombs. The bread was placed as a funerary offering to nourish the dead during their journey to the afterlife. Some of these loaves of bread have been preserved since predynastic times by the arid Egyptian weather for as long as 5,000 years. The illustration above is an etching from the tomb of Ramesses III, who reigned from 1186 BC to 1155 BC. It depicts the process of making bread at the royal bakery. Bread was baked in many shapes, including the shapes of animals. At the top left, there are two workers with poles. The poles were used as pestles to pound the grains and remove the chaff. 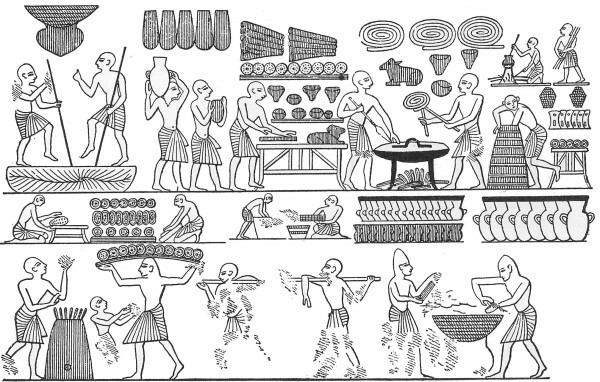 On the top right, there are illustrations of two methods of baking. There is an oven with legs and a lid, and there is a brick oven into which a worker is sticking his hand. The open-top oven worked like the tandoor clay ovens which are used today to bake breads like lavash and naan. Egyptian grain was turned into flour by milling it on a saddle quern, which functioned by moving the grindstone back and forth. Grit from the quern stones was released into the flour and was baked in the bread. Many Egyptian mummies show severe abrasion of the teeth from eating bread containing sand and particles from the grindstones.